John Roger Smith, 89, a lifelong Peshastin resident, passed away on Monday, February 4, 2019 at his home. John was born July 14, 1929 in Marqette, Michigan to the late Benjamin and Helen Smith. He moved with his family as an infant to Peshastin and attended elementary school to high school in Peshastin. 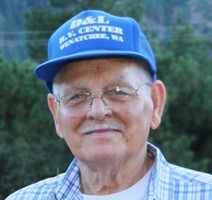 Following high school, he went to work for the Peshastin Box and Lumber Mill where he worked over 40 years until his retirement in 1989. John met Maxine Harrison in 1947 and they were married on September 5, 1949. The two were inseparable for over 70 years. Always together enjoying the outdoors, on horseback when they were young and later going jeeping and exploring back roads hoping to come across wildlife to watch. He was always an outdoor enthusiast and did his share of hunting, fishing and snowmobiling. He also loved travelling with friends in his Chevy truck and trailer & had many fond memories of their trips. John loved going for drives . . . he just loved going anywhere, seeing new places and old, it was hard to ever catch them at home. This beautiful world intrigued him and he couldn’t see enough of it. John is survived by his loving wife, Maxine Smith, Peshastin, WA, son and daughter-in-law, John and Ellen Smith, Mountain View, AR, daughter and son-in-law Jana and Scott Pitman, Leavenworth, WA, grandchildren, Ashley and David Tillotson, Burleson, TX, Jordyn Sauer, Peshastin, WA, Makenzie Sauer, Peshastin, WA, great-grandchildren, Noah, Avery and Evelyn Tillotson, Burleson, TX. He was preceded in death by his parents and eight siblings. You are invited to view his online tribute at www.heritagememorialchapel.com to leave a condolence or share a memory. Arrangements are in the care of Heritage Memorial Chapel, East Wenatchee & Cashmere. To send flowers in memory of John Roger Smith, please visit our Heartfelt Sympathies Store. Provide comfort for the family of John Roger Smith by sending flowers. My condolences to the family. Continue to let your fond memories of John warm your hearts. May God’s promise of a resurrection bring you comfort and hope during this difficult time. John 5:28, 29.